2 "Which side are you on?" 9 Only DSA can save us"
Thomas H. Geoghegan is a Chicago labor lawyer, writer and activist. When Chicago's Wisconsin Steel, suddenly closed in 1980, leaving thousands of workers unemployed and short payed, the Communist Party USA organized a Save Our Jobs Committee, led by Frank Lumpkin. The Save Our Jobs Committee enlisted labor lawyer Tom Geoghegan to initiate legal action in an effort to restore lost benefits. The mill's longtime owner, International Harvester, had sold it to Envirodyne in 1977. Save Our Jobs argued that IH had unloaded the mill in part to rid itself of pension obligations. After years of legal wrangling, a settlement with IH was reached, with around $15 million being doled out to workers. "We got a lot for them, but we never got them their real due," Geoghegan said. In 1996 Tom Geoghegan, Author, Which Side Are You On? was one of the original 130 founders of Campaign for America's Future. In 2008 Thomas Geoghegan was listed on the Advisory Board for the Association for Union Democracy. In 2008, Tom Geoghegan was listed as a sponsor/financial contributor to the Chicago based Business and Professional People for the Public Interest. 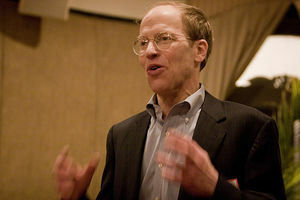 As of February 2010, Tom Geoghegan served on the Board of Directors of the Chicago based Business and Professional People for the Public Interest. Tom Geoghegan has been a guest speaker at Wisconsin's annual progressive Fighting Bob Fest, in 2010, 2011. Only DSA can save us"
This page was last modified on 30 December 2018, at 03:59.